Saving money doesn't mean having to give up on your daily indulgences. With a little creativity and some ingenuity you can beat the gloomy economy and still afford to buy the things you like. The following tips (gathered from previous dealnews features) will help you save money in practical ways without requiring significant disruptions in your life. Ditch your Cable plan: You may think it's a necessary evil, but thanks to the growing number of online sites, cutting your cable service is no longer unthinkable. Hulu, Sling Beta, and ABC are among our favorite go-to sites for free video. Many of the sites even offer free high definition programming. Watch movies at home: Let's face it, most Hollywood movies aren't worth the price of admission. Sign up with Netflix and purchase the Roku Netflix Player and you'll be able to stream movies straight to your living room TV. (Of note, you can also stream Netflix content from your computer, Xbox 360, or select Blu-ray players.) Although it requires a bigger investment, we were also fans of the Vudu 1080p HD Movie Viewing System, which has now been updated with an iPhone app and free video channels. These devices won't show the latest blockbusters, but the money you'll save will make it worth the sacrifice in the end. Purchase used books: Avid book readers can save a few dollars by buying used books. If you have a computer and don't mind reading from your monitor, Project Gutenberg has a large digital collection of literary classics, and best of all, they're free. Otherwise, there are numerous used book resellers and local book-trading websites to help you swap books with neighboring readers. The same principles apply to college students who can save on textbooks by frequenting sites like Half.com or eCampus.com. Gaming: Although it's an expensive hobby, it is possible to save money on gaming. Merchants like GoGamer.com are known for their "Madness" sales while other vendors like Walmart and Best Buy traditionally offer pre-order specials on new games. Quit smoking. 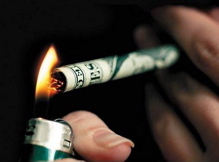 When it comes to smoking, quitting cold turkey is the cheapest way to stop. However, if the mere thought of not smoking makes you go weak in the knees, we've found that using nicotine patches or gum is still more affordable than continuing to smoke. Buy the right exercise gear: You don't need an expensive gym membership to stay in shape. With the right exercise gear, you can lose weight on the cheap. Just remember to look for the right features in your exercise equipment, rather than purchasing the item with the most bells and whistles. Airfare: From avoiding hidden fees to scoring cheap hotel rooms, if you must travel, use aggregators to find the lowest online prices. When searching for hotels, also remember to check if your hotel offers price matching guarantees, which could win you a free night. Stay away from liquidation sales: As we've seen, liquidation sales are not a good time to hunt for bargains. As a result, it pays to know where and when to shop. Apple fans, for instance, can benefit from shopping at Apple resellers days after a new Apple announcement, which is when you'll find the most discounts and combo deals. Don't overuse your credit cards: Paying off your credits cards is the best way to gain control of your finances. Know your interest rate, find out how much you can afford to pay each month, and map out a course of action.